Dental emergencies, just like any other, always occur when they are least expected and require immediate attention when they do. If you or a loved one are dealing with a dental injury or severe tooth pain, you can always contact LakeView Family Dental to get the fast and professional care you need. We’re happy to offer same-day appointments for emergency patients, so they’re able to get what they need and return to their lives as quickly as possible. Why Choose LakeView Family Dental for Emergency Dentistry? Gently rinse the tooth off, but do not wipe it dry! Try to place the tooth back into its socket. If this isn’t possible, put the tooth in a container of milk or saltwater until you’re able to reach us. With a knocked-out tooth, the time we’ll be able to replant it is quite limited, so the sooner you’re able to come see us, the better! Start by rinsing your mouth and gently flossing around the tooth to dislodge anything that might be stuck and causing the pain. If this doesn’t help, call LakeView Family Dental. Before you make it to our office, you can place a cold compress on your face or use an OTC pain-reliever to manage the discomfort. Our practice is extremely fortunate to have a team of expert dentists on staff, many with decades of experience. Whatever your emergency may be, you can trust that at least one of them has handled it countless times before. In addition to general dentists, we also have an in-house periodontist who can treat soft tissue injuries as well as a lab technician who can create custom-made restorations in-house to rebuild damaged teeth. Most of the time, a cavity only affects the outer layer of a tooth (the enamel), but if it’s left untreated for long enough, it can easily reach and infect the sensitive inner layer (dental pulp). This is where the tooth’s nerve is located, and as you can imagine, any issue here can cause quite a bit of pain. 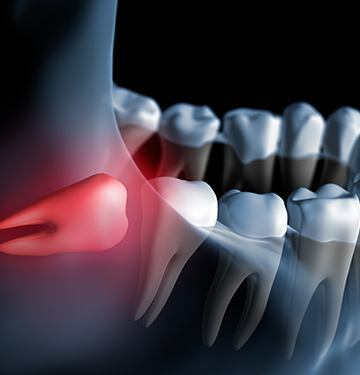 To provide relief from this kind of problem and save the tooth, our answer will likely be root canal therapy. We’ll simply remove the infected tissue, clean the tooth, and then rebuild the enamel with a restoration. 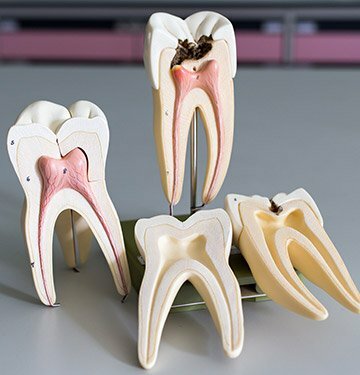 Thanks to modern-day dental techniques, most patients say the procedure is no more uncomfortable than getting a small filling. A LakeView Family Dental, we’re able to provide all types of extractions in-house, including those for wisdom teeth. Using a light touch, local anesthetic, and sedation if needed, we can make sure our extraction patients are able to remain comfortable from beginning to end.